Here's the rifle I received about 10 days ago - I've been away from home for over a week. The welds are fantastic - no pits or inclusions visible, the surface has just the right "puddle" and strong as hell looking. I'd much rather have these than hit or miss spot welds. The rifle is "tight" right out of the box. I have a number of Vietnam war magazines - about 2 out of 3 can be inserted properly. I can't wait to get it to the range! With the detailed report by Combloc I just had to have one. I sold some of my collectibles to be able to buy it - well worth the money. Man, that ain't helping one little bit. Seriously, thanks for posting that, I want one too! That's a fine looking rifle and I hope it gives you much pleasure. My week away from home had me in the Austin, Texas area. I drove down to San Antonio and did the Riverwalk thing and saw the Alamo, again. I hope you had time for some great TexMex food while in SA. Visiting the Market gives ya two fine choices, Mi Tierra and La Margarita. Try them both! Thanks for posting the pics and I hope you are well. It's been a while and I hope all is well in your world. You model L looks schweet to be sure. I also appreciate your insight relative to the magwell dimensions. I hope Marcolmar will take the insight to heart and make a modest manufacturing change to eliminate the issue alltogether. 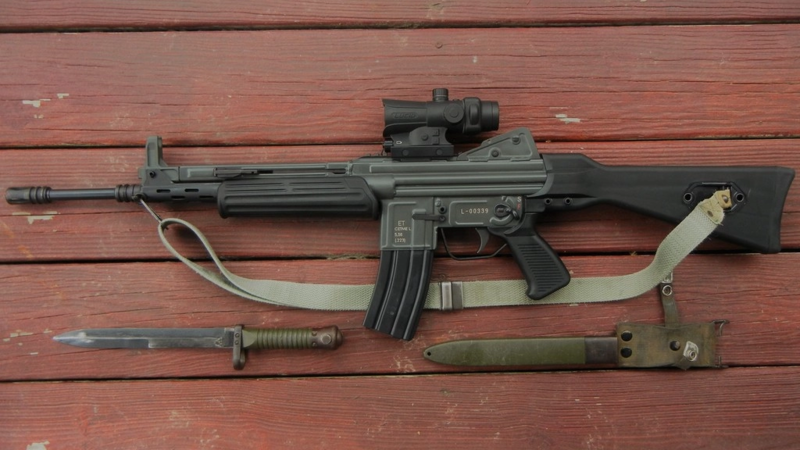 Time to take a FAL breaK, Beautiful rifle Mr. Op.